Each midwinter, the old almond trees that persist behind the petrol station near my house are the first to put out blossom. Ever since I moved here I’ve learned to keep an eye on them for a sign that spring is on the way. Shy at first, the buds soon froth with flowers of the greatest delicacy. They deserve better surroundings, but at least they haven’t been cut down. Now that I’ve seen the almond blossom I know it’s almost time to spray the old peach tree and the young one against leaf curl. The apple trees should be sprayed, too. Even though I love winter it’s good to feel the new season stirring, to know that warmer days are on the way. It’s one of those mornings when the breakfast bowl is at least as beautiful as its contents. 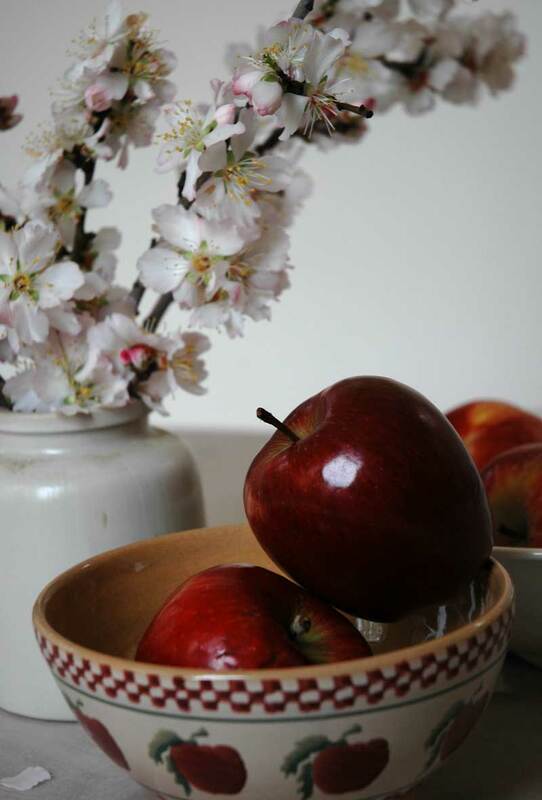 One ‘Red Delicious’ apple, grated into homemade muesli with a spoonful of yoghurt, is a simple way to start the day, and the bowl, Irish spongeware from the Nicholas Mosse Pottery in Kilkenny, is soothing to the eye. Imagine waking up each morning to the prospect of making, by hand, something beautiful. It’s this that drives artists and craftsmen, all creative people everywhere; it drives writers, too. But pottery is so enduring, and when I think of the shards – indeed, complete pots – excavated from tombs, from Pompei, when I wash and dry my apple bowl and know for sure that it will outlast me, I am both grateful to its maker, and just a little envious, too. 26 Jul	This entry was published on July 26, 2012 at 9:05 am. It’s filed under Uncategorized and tagged apples, beautiful breakfasts, blossom, carol lefevre, creative writing, food writing, nicholas mosse pottery, red delicious, spring, winter. Bookmark the permalink. Follow any comments here with the RSS feed for this post.